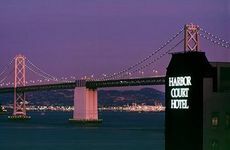 Find Harbor Court Hotel deals, discounts and special offers. A waterfront boutique hotel featuring complimentary tea & coffees, evening wine reception, & access to pool & gym. This budget hotel features a palm-lined courtyard with heated pool and complimentary breakfast served poolside. This ultra-modern hotel is located near the American Conservatory Theater and features free WIFI and fitness room. Originally constructed in 1903, the Hotel Drisco offers a complimentary breakfast buffet, free WIFI, and a pillow menu. Located near Union Square, the Hotel features an exercise room and a seafood and artisan meats restaurant. Trendy boutique hotel close to Market Street and upscale shopping, featuring a sky-lit library and onsite restaurant. This Japanese pop-culture hotel features a modern fitness facility, restaurant, and indoor parking. This art-deco historical hotel is non-smoking and features free WIFI and complimentary morning coffee. Boutique hotel at the base of Nob Hill, close to Union Square and featuring eye-catching decor and modern amenities. Located on Union Square, this non-smoking luxury hotel features 92 rooms, fine dining restaurant, and free WIFI. The retro 1950's hotel is non-smoking and features 44 rooms, free complimentary breakfast, and central courtyard. The White Swan Inn has 26 rooms, all with fireplaces, and has a free gourmet breakfast and evening wine hour. This Bed and Breakfast inn with European decor is located in North Beach and features free breakfast, wine hour. A Kimpton brand hotel located across from the gates of Chinatown that features a fitness center and evening wine bar.